Glitter 'N' Sparkle Challenge# 185 - Anything Goes! 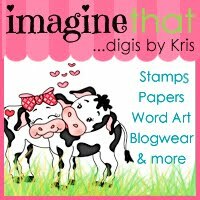 All Digital Stamps from Imagine That! are drawn by Kris and her daughter. It is the home of Digis by Kris and Carly's Cuties. You can't get much better than a mother and daughter team with loads of talent! They offer cute, family-friendly images and papers. All of the digital sets include outlines and pre-colored versions as well. This week for my card I used the lovely bike image from J'aime Paris from Imagine That.